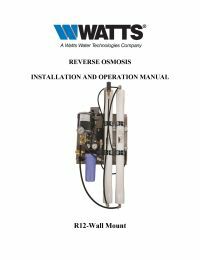 The Watts R12-1200 light commercial reverse osmosis system is designed to provide the commercial and industrial user with the most trouble free, cost effective and reliable form of water treatment available, by providing every option necessary for a successful installation. Choose from three available packages to get the features you need. 22" x 32" x 12"